to the bottom of the page for a guide. MPPT charge controllers optimize the output from solar panels and produce greatly increased solar charging performance. 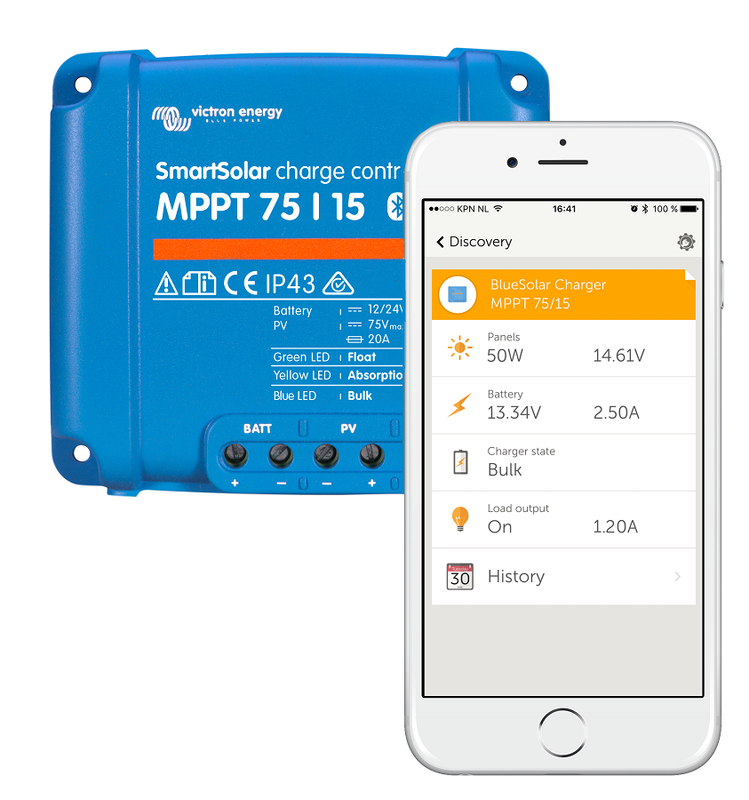 These charge controllers with built-in Bluetooth can be wirelessly networked to a smart temperature sensor to respond to battery temperature. All networking is set up using the Victron Connect App which can be downloaded from the iTunes or Android store and is also available for Bluetooth equipped Macs and PC. 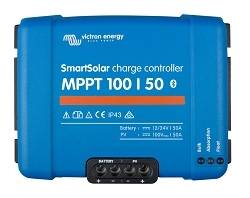 The charge controllers can be programmed for different battery types and performance can be monitored in real time as well as showing a 30 day snapshot. A 30 day data file can be output for further data analysis. 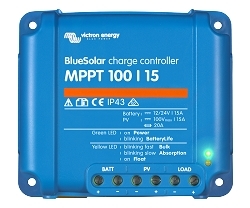 Additional accessories are available such as the Color Control GX, a display that shows a complete Victron Energy system. 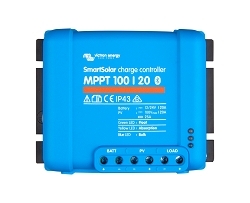 The part number of the MPPT charge controller represents the two main parts of the specification, the first number means the maximum allowed open circuit input voltage, the second means the maximum output amps. 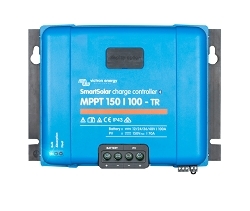 Because the charge controllers can be used with different battery voltages the size of panel supported by any particular panel depends on the system voltage. 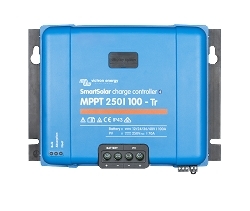 A 30 amp charge controller in a 12 volt system could support 440 Watts of solar but the same charge controller in a 24 volt system could support 880 Watts of solar. 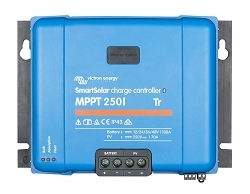 The table below shows the specifications of the main models. 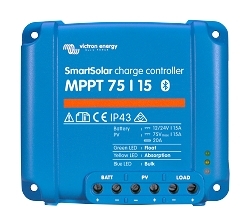 For installations where the panels are in series and produce a higher input voltage it is recommended to get the optional wire box to shield the terminals and prevent accidental contact. At PKYS we only stock the TR models with screw terminals. 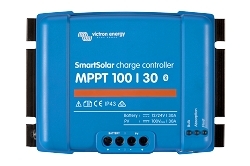 The bigger MPPT models are also available with MC4 terminals by special order. We dont find these particularly useful for boats or RV's because the MC4 plugs would require you to drill too large a hole so the plugs end up being cut off anyway. Note that higher panel voltages may not be suitable for marine or mobile applications, If electricity and water dont mix well then 250 volt DC electricity and water mix even less well !!! 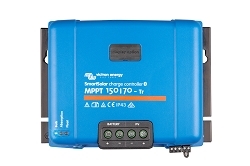 These higher voltages are best used in residential systems.